Today’s cards, the Hermit (which unfortunately I can’t include an image of today) and the Hierophant, have so much in common: a focus on seeking wisdom, meditation and contemplation, and a predominance of green, the color of the heart chakra. But these cards are also, in some ways, polar opposites: the Hermit prefers solitude, while the Hierophant, a teacher or counselor, can be found around institutions, such as religious or educational institutions. How are we to interpret their appearance together? Does the Hermit become the Hierophant, having realized that he has something to teach us? 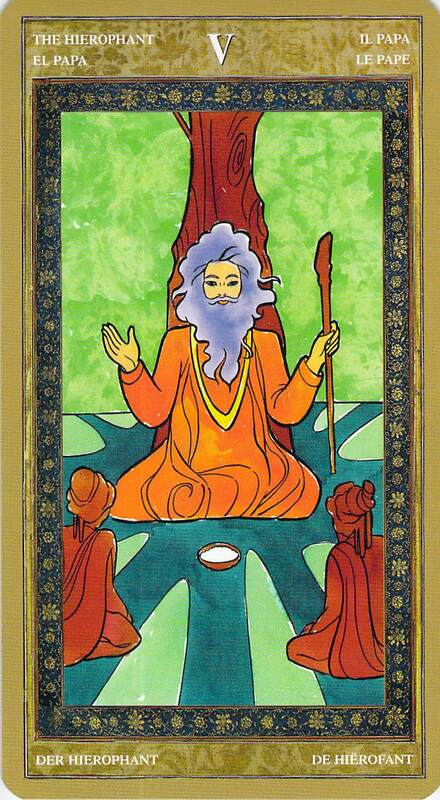 Or does the Hierophant go within, and take time for solitude and contemplation, in order to find wisdom to teach? Or do these cards tell us that the best teaching comes from the heart and is rooted in a spiritual practice? All these things, I think, are true. But there’s a deeper message here today too. The support that we need so much is available to us, in spades. It’s available within (The Hermit) and without (The Hierophant). We just have to look for it. Really? I think I am one (The Hermit), while my husband is often The Hierophant…thanks for the comment! Nice interpretation of how the two cards can complement each other.